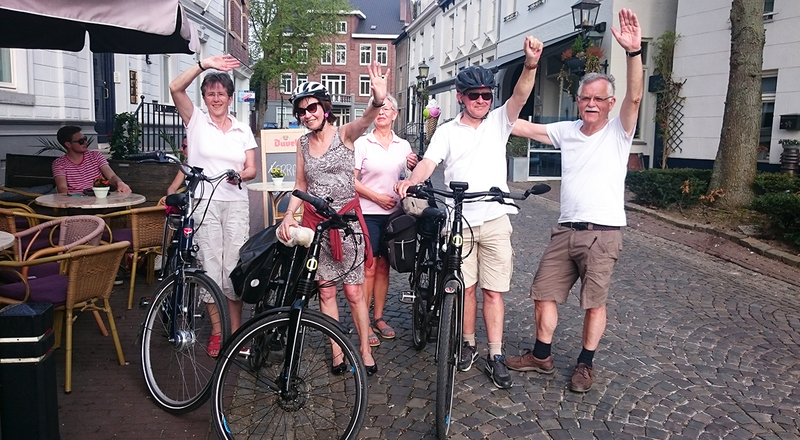 Herman Langenveld, the initiator of Via Douzelage and a few enthousiastic and courageous others from Douzelage Meerssen, took the very first step by bicycling 320 km in 4 days through the Benelux countries. Starting point was Niederanven (Luxembourg). Jean Schiltz of Douzelage Niederanven welcomed them very warmly and gave them a tasty meal. The next day 50 km were cycled to Bourscheid-Plage (also in Luxembourg). From Bourscheid-Plage to Houffalize (Belgium) was about 80 km. Also in Houffalize they were treated as kings and queens and slept and ate in Vayamundo (where our Douzelage youth will be during their Houffalize Summer project). Then a very challenging day followed, cycling 100 km to Monschau (Germany), and they succeeded! The last part of 90 km to Meerssen was done today, where they were welcomed by some members of Douzelage Meerssen and had some very tasty beers! Herman will give more info on their successful adventure during the GM in Oxelösund. He cannot wait to take it further to other Douzelage towns! ← Douzelage Photo Contest: Bring your camera to Oxelösund!